Color blocking has been in and out of the fashion scene for a few years, but now it’s back with a new twist. This spring, we saw color blocking with gorgeous pastels and bright neons. Now, the popularity of color blocking is following into autumn as well, this time with rich colors, monochromatic shades, and pairing patterns. What does fall color blocking look like for 2018 and how can you get in on this gorgeous, confident trend? Read on for color blocking 101 and inspiration to incorporate this look into your wardrobe. Color blocking is typically the union of multiple solid colors together. A single outfit or garment is divided into “blocks” of color, usually ranging between two and four contrasting colors. It’s similar to patchwork, where different materials and colors are sewn together in a deliberately asymmetrical way. I love color blocked styles because they make matching a breeze. 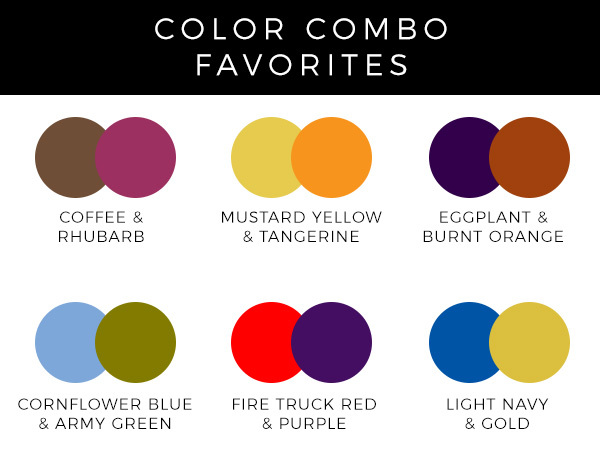 You have a lot of bold colors working against each other, which makes it easier to mix and match. You don’t have to worry about matching the exact hues or shades, because you’re already pairing together unlike colors. Think of color blocking like purposeful mismatching! What are the fall color block trends? There are three key trends for color blocking this fall: monochromatic blocks, contrasting fall hues, and print blocking. Let’s delve into these exciting new looks! Color blocking is usually about pairing contrasting colors. This juxtaposition of color is what makes these “blocks” so appealing to the eye. However, this season we’re seeing a new type of color blocking that doesn’t use contrasting colors. Instead, we’re finding one color in varying tones. This monochromatic (“one color”) style is a gorgeously subtle way to indulge in the fall color blocking trend. This works by matching different hues or materials together within the same color family. For example, a dress might pair a bright red with a dark maroon with a pastel pink. Or you might have a similar red hue that has blocks of velvet, suede, and cotton in different blocks. Monochromatic blocks are a great way to try out color blocking if you’re not used to daring, intense outfits. You can opt for a single color that you love (and that looks great on you), and then block with variations of that same pigment. Try out different fabrics and materials too. It creates a textured look that is highly flattering and eye-catching. The hottest monochromatic colors of the season are purples and reds. For purple, try out everything from lilac to lavender to violet. For reds, don’t be afraid to go bright and bold this season. Interestingly, some designers have even started pairing these two hot colors by mixing red with purple through an underlay of brown tints. Everyone knows and loves the rich colors of autumn. Deep browns, yellows, oranges, and reds remind us of the warm embrace of the season. Other gorgeous fall colors include camel, navy, charcoal, and beige. Denim is a typical autumnal fall material. Dark denim matches beautifully with most fall colors, and it will keep you warm in the brisk air. Interestingly, denim is coming into the block trend as well. Some designers are pairing different washes of denim in jackets and pants to create a unique vibe that’s unique from the typical denim look. You can even pair dark jeans with a light wash jacket for a quick and easy color block look. I love the look of blocking different types of denims with a few prints and bold colors. The contrast will grab attention with surprise and delight. Color blocking usually includes colors, but pattern blocking is an incoming trend for fall. Mixing and matching patterns, especially animal prints, is a bold way to go against fashion conventions into something more courageous. You might have one pattern in lots of colors. For example, you could have one block of vertical red and blue stripes, another of horizontal green and purple stripes, and a third block with diagonal red and purple stripes. The overlap of colors unites the blocks while still creating daring contrasts. Print blocking also pairs multiple patterns together. You could have one block of stripes, one of polka dots, and one of a solid color. It could even have one block of cheetah print, one of zebra, and one of neon pink. It takes a confident, graceful woman to pull off this look. Throw on a smile and start your strut, and you’ll be able to pull off this print blocking with ease! Try out a color blocked scarf with a little black dress to pair the classic and the trendy. Or go for a color blocked hat with beige trench coat. You’ll love the way the accent colors create a strong statement against your wardrobe essentials. I especially love the look of color blocked platform heels. These have a different color on the front, heel, and sole. Some even include animal prints as well. This stunning contrast instantly draws the eye, making it perfect for work or for play! Don’t be afraid to take on color blocking and make it your own! With the monochromatic look, you can pair your favorite pieces together in a stunning singular color palette. With print blocking, you can throw on all of your favorite animal prints from a decade ago. And with contrasting fall hues, you’ll be able to indulge in the richness of the season, cozying up with your favorite sweaters, accessories, and autumnal colors. How do you wear the color blocking trend? Show off in the comments below! Fantastic blog post. I can’t wait to share it with pals. Wonderful subject, I ‘d like to find out more about it in the future.